So that is exactly what I’m serving as the final episode of this 4-part series. But first, let me give you a quick recap of the snow festivals I’ve taken you to so far! If you prefer a snow festival with an upbeat city vibe, you’re sure to enjoy PART 1 – the Sapporo Snow Festival. Now if you prefer something away from the city to see how Japan does it big and majestic, the Asahikawa Winter Festival’s snow performance stage is sure to win you over… Check out PART 2! Still want something more unique? Then why not take a gander at PART 3 up in the mountains of Daisetsuzan National Park for the Sounkyo Hot Springs Winter Festival. While you’re at it, taking a dip in the onsens or hot springs is sure to keep you warm amidst the freezing temperatures! 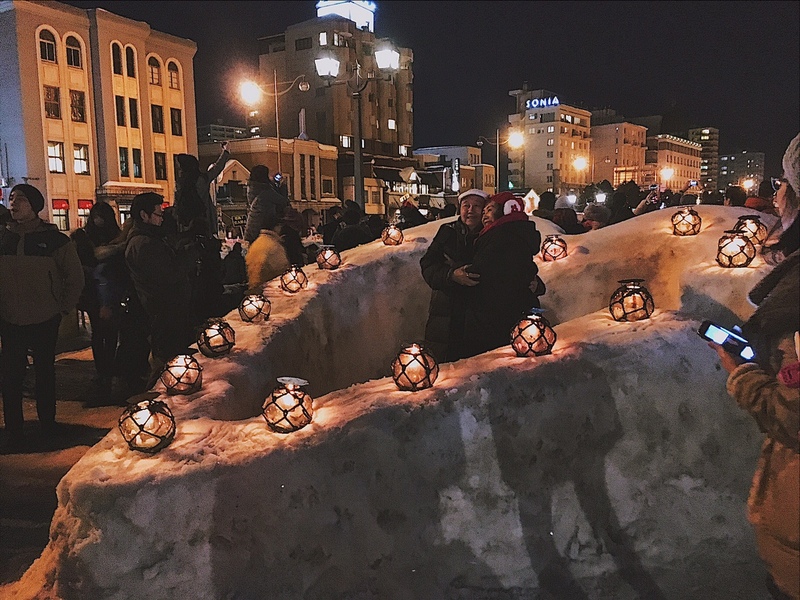 Now, should you decide to hit up one more festival just a 45-min local train ride from Sapporo, then you’ve arrived at our last stop – PART 4: the Otaru Snow Light Path Festival. It is called Snow Light Path for a reason – it is meant to be enjoyed at night. Thankfully during the day, the Otaru tourist rush had not yet set in. It was relatively calm and it was lovely watching how the South Korean volunteers were cheerfully creating (and assuming, retouching daily as well) all the little snow sculptures scattered around the two main areas. As much as I want to show the beautiful side to traveling, I also want to show you harsh reality of it. Consequently, daylight also revealed nature’s truth when snow gets muddy and melted – not exactly a picturesque Otaru, snow angel environment. See, if you’re hitting a popular destination like Otaru at peak season, you need to mentally prepare yourself for huge crowds, endless photo bombers, dirty surroundings, long lines – not to mention annoying people cutting in line, and if luck decides to plot against you – a drastic serving of poor weather. When night fell, I was overwhelmed and stressed by the insane amount of tourists that I nearly slipped several times on muddy, melted snow. I know right – boo freakin’ hoo, Bianca! Poor you, SMH! We all perceive experiences uniquely. I will be the first to admit that after coming from the other three festivals, most especially Asahikawa; of course I had my expectations. As seen in the video, it was only when I had seen that older couple intently holding one another with so much love and presence amidst the tourist pandemonium that it made me realize: an adventure is what you make of it. I mean look at them! They had their own world and nothing else mattered. Just as I want to inspire you all to embark on your own adventures, I believe it is also my responsibility as an avid traveler to manage your expectations by equipping you with the truth of what to expect – what could possibly happen so you don’t get surprised or disappointed. If a place quickly becomes popular and highly commercialized, you already need to accept that most likely it will be filled with an insane amount tourists. Why wouldn’t it be? Anywhere you go, realize that every person is just as entitled as you are to have a great time, take a great photo and take home some breathtaking memories. Besides, the concept of a “good time” is subjective and relative. What may be a blast for you, may be so-so to another. It is not bad nor good – it is simply preference. Alas, after several attempts of trying to live up to my own standards of so-called Instagram-worthy photos… forget composition, framing, or artistic vision, haha! In this day of social media, it is not about the photo – it is about the moment. Don’t let a bad photo or lack thereof define a beautiful experience. We all go through times where we take things, people or experiences for granted. It’s only when we observe how other people take in certain moments with such joy that you snap out of your bratty funk. The best of times are not determined by the weather or the food or the pretty flowers or a person. It is determined by you – your mindset – your perception. Embrace the power of knowing that: When you fully accept moments for what they are, no matter how simple they may be, they will bear so much more meaning because YOU say so. So there will be times you will forget how unbelievably blessed you are to live another day to create more memories. Some people never get that privilege. So soak it all in like it were your last and you will always be content. I guess it’s safe to say I’ve offered a mini-mini-marathon for you all to watch, compare and be inspired for your future Japan trips. Each one is truly different from one another; that if planned well, you can actually hit up all snow festivals in one trip! Yes it’s truly possible, just as I did!